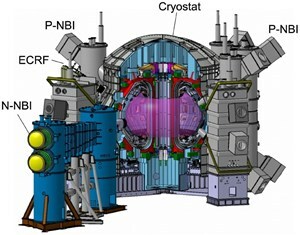 Cutaway of the JT-60SA Tokamak. A few years before ITER is due to come into operation, the advanced superconducting "satellite" Tokamak JT-60SA, conducted under the Broader Approach Agreement between Japan and Europe, will start operation. With a low aspect ratio design focused on high shaping flexibility, JT-60SA will be able to explore advanced regimes in support of ITER and in preparation for DEMO. More than 40 MW of additional heating will be available with a plasma current up to 5.5 MA. Using the building, power supply, and neutral beam infrastructure of JT-60U, a completely new load assembly is being fashioned by suppliers contracted to JAEA, to the Japanese National Program, and to voluntary contributing institutions inside Europe—CEA (Saclay, Grenoble and Cadarache), ENEA, CNR, CIEMAT, SCK, and KIT. 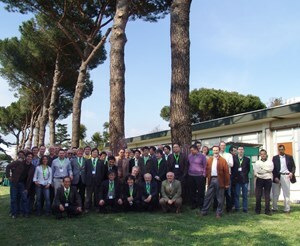 The participants to the Technical Coordination Meeting in Frascati, Italy, in April 2010. Already, under Japanese responsibility, the disassembly of the JT-60U machine is well underway, poloidal field conductor is being manufactured and coil winding has just started, and the first segment of the vacuum vessel is being fabricated. Europe is about to place the contract for the cryostat base, sign agreements for the production of the toroidal field coils and structure, and current leads, and begin manufacture of new magnet power supplies and quench protection systems. The project functions through an Integrated Project Team, currently made up of a small project team dealing mainly with project management, plus Japanese and European home team personnel handling procurement and project integration. You can see our progress at http://www.jt60sa.org.